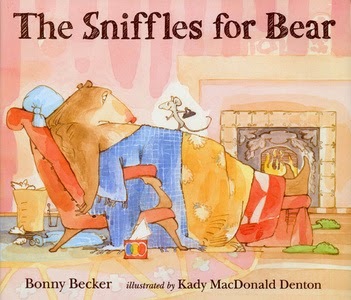 I found the perfect present for my hubby: Bonny Becker's children's book: The Sniffles for Bear (Bear and Mouse). It's like giving him a self-portrait! Because whenever hubby gets sick, he acts like Bear. Whining and acting like he's on death's door. And just like Bear, he doesn't really wánt to feel better when he's sick. He's relishing his role as a victim way too much. What's your hubby like when he's sick? You hit my hubs on the nail too! I dread when he walks through the door and I can tell immediately that milking time is upon us. He acts the same way. This made me laugh. I am getting the book for the grandkids and my students though. I'm glad I'm not the only one with a husband that can be a bit of a whiner. Haha, this sounds exactly like my other half! :D Thanks for sharing over at #FridayFrivolity! I hate to sound sexist, but this is frequently true. Some men can be babies when they're ill. 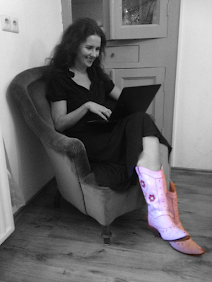 Thanks for sharing at the Blogger's Pit Stop. I don't think that sounds sexist at all Debbie. It sounds like the plain truth to me! Yes, it really is a cute story. And the pictures are lovely too. That's how my husband is at times when he is sick, too! Funny how that works! Thanks for linking up with Let's Get Real!